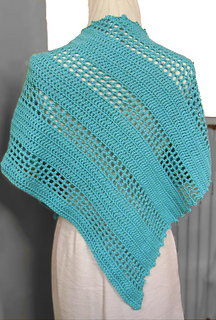 You can make this shawl out of any yarn of any content of any weight. Blocking greatly improves its appearance so I recommend yarn with a majority wool content. The picots are worked as you work the main body of the shawl so any color changes that occur in your yarn will also occur in your picots. 400 yards (of any weight) will yield a neck scarf or shawlette, 800 yards (again of any weight) will yield a full sized shawl. The gauge swatch is the first few rows of the pattern and since this is customizable you may choose your size.